Canada: This CD is distributed by Outside Music for Canada. A native of Yorkshire, England, Paul Hyde emigrated to North America in his teens, a tough northern lad who burst on the scene in 1979 as the voice of the Payola$, a band he formed with guitarist/co-writer Bob Rock (now best known as a hit producer). The Payola$ tallied six albums, gold and platinum records, considerable airplay and four Juno Awards. After the group dissolved in 1988 (including one lp as Rock and Hyde), Hyde went solo in 1990. He recently toured with The Storyteller's Cabaret. 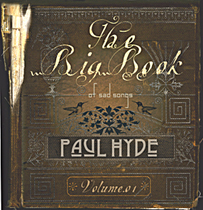 Visit the Paul Hyde website.